A gentle blend of plant-based oils. 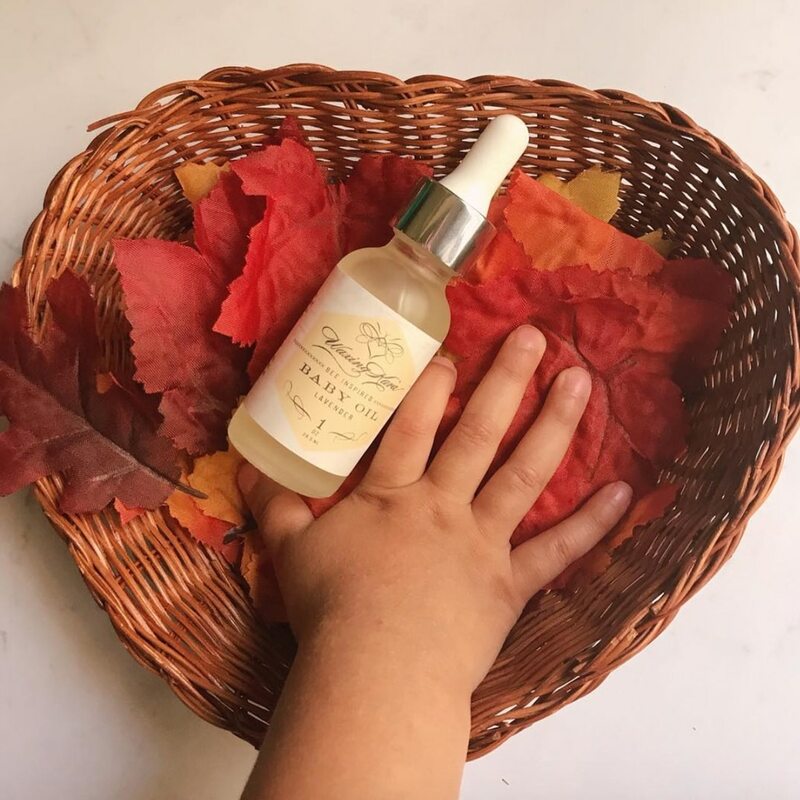 Bee Inspired Baby Oil is vegan and gentle on the most sensitive skin. With Bulgarian lavender comes soothing relaxation that will have baby (and you!) off to sleep in no time. Ideal for adults with sensitive skin. Comes with baby massage instructions written by the professional massage therapists of the Spa at Cliff House Maine. Earn 15 Points when you purchase this item! Developed in collaboration with Cliff House Maine for their “babymoon” clients, Bee Inspired® Baby Oil with Lavender was designed to soothe the sensitive skin of infants and adults alike. Made with only gentle ingredients, this oil is vegan and 90% organic, and so soothing when you and or baby need a moment to relax. For adults, the nourishing properties of the sunflower, jojoba, and apricot oils help to boost the skin’s natural radiance while providing moisture and antioxidants. The inclusion of Bulgarian lavender oil not only calms your mind, but aids in the renewal of your skin, improving the appearance of scars, discolorations, and uneven texture. Who it’s for: Developed for infants and those with sensitive skin. What’s inside: A gentle, nourishing blend of organic sunflower, jojoba, and apricot oil provide protection against dryness and irritation. A touch of Bulgarian lavender oil gives a soothing fragrance while also calming redness and reducing the appearance of discolorations in the skin. How to use: Be gentle with baby’s skin! Apply after their bath or during an infant massage routine, included with the product. For your own skin, apply while damp. Safe for use on face and body. Balanced for all skin types with a light formulation of non comedogenic oils. Ingredients: Organic Helianthus Annus (Sunflower) Seed Oil, Organic Simmondsia Chinensis (Jojoba) Seed Oil, Prunus Armeniaca (Apricot) Kernel Oil, Lavandula Angustifolia (Bulgarian Lavender) Oil. Babies are so pure and precious. Babies should be showered with love, touch, respect and gentleness. They do not need to be showered with harsh ingredients on their skin and body. Infant massage has been shown to strengthen the parent/child bond and encourage better sleep, relieve colic, stimulate intellect and bolster your baby’s immune system. How often should I massage my baby? Daily is ideal. Our clients find that incorporating this practice after bath time makes for a healthy routine. What ingredients are used in this baby oil blend? Our Bee Inspired ® Baby Oil is a completely plant based hand-blended oil. The plant oils selected would not be available if it were not for the honeybee. This formula is 90% organic and contains organic sunflower oil, organic jojoba oil and apricot kernel oil along with essential oil of Bulgarian lavender. If your baby or toddler has very sensitive skin, it is a good idea to perform a test on their skin before applying any new product. Dab a small amount of product on the back of his or her hand and check for any skin reaction. A baby’s environment is so important. A newborn’s sight is not quite yet developed and by creating a soothing environment with a hint of lavender in the air and calming piano music playing can do wonders for baby and parent. Make sure the room is warm, blankets are soft and lighting is dimmed. Begin when your baby is in a quiet alert state, not when your baby is too sleepy or after a feeding. Verbally or nonverbally (body language, facial expressions, eye contact) ask for your baby’s permission before beginning the massage. This successful communication to gain permission establishes positive boundaries, shows respect for your baby and fosters empowerment. Undress your little one down to the diaper and lay baby on back in front of you. Start with a gentle stroke from head to toe with no oil to say “hello” while you keep continuous eye contact. Watch for your baby’s comfort level communication through their body’s response to this action. If they stiffen, curl away, or get agitated during the session, move to another body part, adjust your pressure, or conclude for the day. Honor their wishes. —Starting at the sternum (breastbone) with both hands make a heart shape from sternum to shoulders and down to the base of the ribs coming together. Go slow and with loving intent. —With the outer edge of your right pinky finger tracing the ribs, move with both hands in a clockwise direction making a circle from the ribs to the hips. This stroke promotes healthy digestion. Note: Avoid the umbilicus area, especially if it is still healing from birth. Hold knees and feet together and gently bring bent knees toward chest. Next, rotate hips around to the right. This stroke helps to expel gas. If you wish to further this motion, you can do “the bicycle” stroke with each leg independently for more digestive benefit. —Support limb with one hand and gently use the other in a C shape to stroke downward towards the hand or foot. Now place limb down and use both hands in the same direction you did previously, but now using the motion you would use if you were gently wringing out a towel. —These are rich areas for health benefits within the body. Massage the palms with your thumbs, next massaging each finger independently. For feet, use the same strategy. —Place baby on tummy with head to the side. Before language development, babies communicate with the world around them through touch. The power of touch to soothe is a natural impulse. Baby massage is a reciprocal exchange of love through touch. 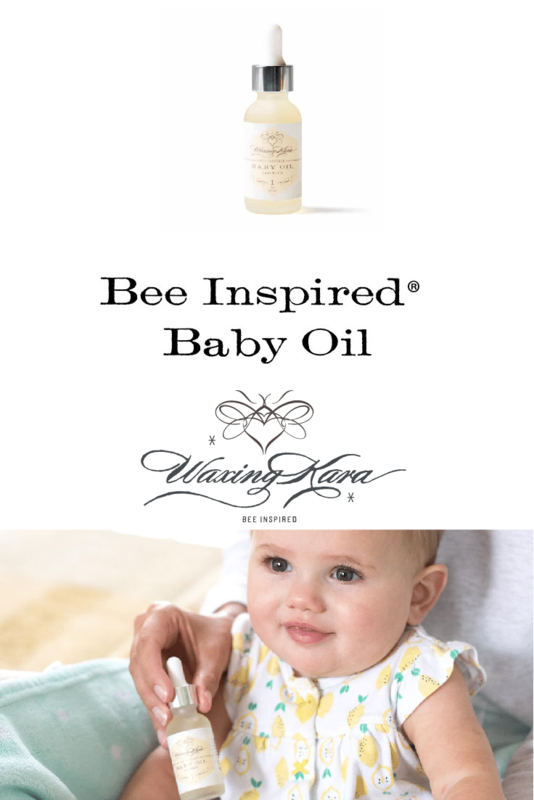 Using our Bee Inspired® Baby Oil, baby massage will create a positive connection between mind, body and spirit.